My husband and I have been trying to have children for the last four years. 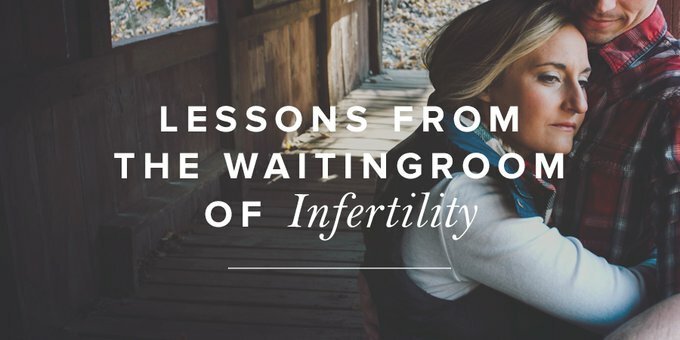 While the experience of infertility has taken us both on a journey neither of us wanted to travel, the experience continues to teach and refine our faith. Through these last four years, I have learned several valuable lessons in my walk with the Lord. Early on in our time of trying to have children, neither of us opened up to our local church community about the news. Sure, I told a couple of close friends who lived hundreds or thousands of miles away, but those in close proximity were held distant. I hadn’t yet grown close with the people in our small group, and when I felt the Lord nudging me to be vulnerable, I objected and kept my mouth shut. Looking back, I now see why the Lord was leading me to open up to others. The isolation forced us into deeper pain and loneliness than was necessary. In the most difficult time of our marriage and my life, I isolated myself from others in an attempt to protect myself. But instead of protecting myself, I ended up inflicting more harm. The first year and a half of our struggle to conceive broke me down in ways I’m still trying to process. My husband and I felt alone and grasping for straws as we navigated the darkness of grief for something that wasn’t happening. Yet God, in His goodness, answered our prayers by surrounding us with community. As we took the step of obedience in opening up to others around us, the Lord used our honesty to bring immense healing to us individually and as a couple. We opened our lives to others for them to mourn with us (Rom. 12:15) and as we sought the light, He gave us sustaining fellowship (1 John. 1:7). 2. Trust the Lord and recall His faithfulness. Time after time after time, we have been faced with this truth: It is the Lord who opens and closes a woman’s womb. Leah and Rachel’s stories shows us that the Lord can open a woman’s womb or choose to keep a woman barren (Gen. 29:31, 30:22). Hannah’s story in 1 Samuel also shows us that God has the ability to open a woman’s womb when He wills (1 Sam. 1:5–6, 19). Hannah’s story is filled with pain and longing. The narrator of 1 Samuel tells us that “year after year” she would be tormented by the fact that she couldn’t have children. Her desires to have a child were misunderstood by the high priest (v. 14) and her own husband (v. 8). But amid her pain, the Lord remembered Hannah and allowed her to conceive (v. 19). This timing paved the way for Hannah’s son, Samuel, to be devoted to God and bring Israel to the Lord throughout his lifetime. Seeing God’s faithfulness to Hannah encourages me when I feel there is no hope. This same encouragement comes when hearing of God’s faithfulness to His people during times of despair. This can come from recalling my own story or another’s story, but the same truth rings true: He is the same yesterday, today, and forever (Heb. 13:8). 3. Waiting has a purpose. I realized early on in the journey of infertility that the Lord is not taking me through this so I can simply reach the end goal of having children. Waiting has a purpose. The Lord is using this time of waiting to shape me into the person He desires me to be. He is using this time of waiting to refine me into His image. He is good and faithful. Romans 8:18–30 reminds me that my waiting shines light on the greater picture of all of creation eagerly waiting for freedom. The advent of this life, with the painful waiting of infertility, is ultimately to bring glory to God through His final redemption. God also teaches me through this time of waiting to look to Him for patience and endurance. When I am weak and I don’t know how to pray for patience or endurance, I can rest assured that the Spirit of God, Himself, is interceding on my behalf (Rom. 8:26). 4. Think on truth and reject lies. Women who struggle to conceive are bombarded with lies that come in all shapes and sizes. If only I lost ten more pounds, then my body would ovulate. I’m not pregnant this month because I had cookies and that threw off my cycle. Because I struggled with sexual sin before marriage the Lord is now punishing me. I’m not worthy of being a mother. My husband will leave me if I can’t give him children. Will my husband still love me if I never get pregnant? These are just some lies that have gone through my mind or have been brought up in discussion with other Christian women traveling this road. It’s easy to fall into a vicious cycle of lies, and it’s even easier to stay there without community. There are times I have spoken these lies out loud and dear friends have called them out as just that—lies. The freedom I experienced from having another help me identify Truth that I wasn’t believing or couldn’t see is still amazing to me. At the end of the day, if I have no children and have the Lord, I know I will be okay. And not only okay, but living an abundant life. Some days, this truth is harder to believe than others. When that happens, I recall the truth found in Psalm 23: "The Lord is my Shepherd, I shall not want." He knows what I need more than I know what I need. He knows what I want before I know what I want. Sometimes, I have to simply obey and pray to the Lord, acknowledging that He knows better than I do. And on the days when I don’t know how to pray, I ask the Spirit to help me trust that this remains true in my life. Early on in this journey, I turned to the Lord, but not fully. I was bitter and angry that my story had to be a painful one. Praise God that He has softened my bitter heart and is continuing to show me His goodness in the midst of this great pain. As I look back and recall God’s faithfulness through the last four years, I look ahead, knowing He will remain faithful. I also know He will continue to teach me more about Him and His purpose for this time of waiting as I seek Him in truth and community. May He do the same for you. Kelsey Park currently lives in Nebraska with her husband, Daniel. Through experiencing infertility, Kelsey's passion for communicating God's truth was reignited. By God's grace, she currently lives a multi-faceted life: helping her husband with all aspects of worship ministry, meeting with women to discuss the intersection of life and faith, and living life to the fullest.